Aim: The aim of this study was to investigate the anti-fungal activity of Morinda citrifolia fruit extract on Candida albicans. Materials and Methods: Juice extract from M. citrifolia fruit was lyophilized and used in anti-fungal testing. Anti-fungal activity of M. citrifolia fruit extract against C. albicans was tested in vitro at various concentrations. The inhibitory effect of M. citrifolia extract on C. albicans was determined by agar culture and applied broth dilution test. Results: M. citrifolia extract at 1000 μg/ml concentration effectively inhibited the growth of C. albicans (16.6 ± 0.3) compared with the positive control - amphotericin B (20.6 ± 0.6). It was found to be a dose-dependent reaction. Conclusion: M. citrifolia fruit extract had an anti-fungal effect on C. albicans and the inhibitory effect varied with concentration. Candidiasis is a fungal infection caused by genus Candida involving almost all parts of the body tissue which ranges from mild, localized lesions to severe, systemic ones. Candida albicans is the species most frequently important in causing oral infections. The most common infection of the oropharynx is oral candidiasis. It is one of the most prevalent opportunistic infections affecting the oral mucosa. It is clinically presented in various forms such as angular chelitis, denture stomatitis, hyperplastic (candidial leukoplakia), chronic atrophic (erythematous), median rhomboid glossitis, endocrine-candidiasis syndrome, inflammatory papillary hyperplasia, mucocutaneous, and pseudomembranous. , The increasing prevalence of acquired immune deficiency syndrome and other immune-compromised patient groups in the society, the increased usage of broad-spectrum antibiotics, and corticosteroids, commonly occurring endocrine disorders such as diabetes mellitus, and severe nutritional deficiencies have resulted in the revival of oral candidiasis as a relatively common illness in patients. Due to the recently seen increased resistance to anti-fungal agents by these fungi and the adverse effects of the anti-fungal agents currently used in dentistry, there is a need for a safe and efficient alternative option for the prevention and treatment of these infections. Several anti-fungal agents are commercially available in the market, but these agents can alter oral micro-flora and have side-effects such as vomiting, diarrhea and staining of teeth. Hence, the search for alternative natural products with less or no side-effects continues and phytochemicals isolated from plants used as traditional medicines are considered as better alternatives. The WHO in 1998 has estimated that 80% of the people in developing countries use traditional medicine exclusively. Morinda citrifolia commonly known as "Indian mulberry or "noni" was first discovered as a medicinal plant in Southeast Asia, and is now prevalent is almost all parts of the world invariably. It is reported to have a broad range of therapeutic effects, including anti-inflammatory, anti-microbial, anticarcinogenic, analgesic, hypotensive effects, and also proved to show immune enhancement in humans. ,, The juice of this fruit is used popularly as a medicinal drink and is used for the treatment of different kinds of diseases such as diabetes, hypertension, arthritis, muscle pain, cardiovascular disease, gastrointestinal disturbances, menstrual disorder, and also cancer. It is also used as an immune enhancer and as an antiviral, anti-fungal, antibacterial, and antiparasitic agent. A previous study shows that the beneficial anti-microbial effects of M. citrifolia may result from phenolic compounds abundantly present in the fruit which includes L-asperuloside, acubin, scopoletin, alizarin, and other anthraquinones. However, there are very few documented reports regarding the anti-fungal activity of M. citrifolia on C. albicans. In an in vitro study, an aqueous extract of the M. citrifolia fruit was shown to interfere with the serum induced morphological conversion of C. albicans from cellular yeast to a filamentous form;  therefore, it might have significant therapeutic effects against all the Candida infections. With this background this study was conducted to assess the in vitro effect of M. citrifolia extract on C. albicans. Ripe fruits of M. citrifolia were collected from Madurai, a city in the southern part of Tamil Nadu, India. The fruits were cleaned in distilled water and juice was collected. The juice was centrifuged and later lyophilized to dryness to obtain a powder extract. Serial dilutions of extract were prepared (solvent - water) and final concentrations of 1000, 500, 250, 100 μg/ml were obtained for further testing. The microbial strain used for this study was procured from the Institute of Microbial Technology, Chandigarh (C. albicans, MTCC 3958). Stock cultures were maintained at 4°C on the slant of nutrient agar. Active cultures for experiments were prepared by transferring a loopfull of cells from the stock cultures to test tubes of nutrient broth for fungi that were incubated for 24 h at 37°C. The assay was performed by disc diffusion method. Anti-fungal activity of the given sample was determined by disk diffusion method on Muller Hinton agar (MHA) medium. The MHA medium is poured in to the petri plate. After the medium was solidified, the inoculums were spread on the solid plates with sterile swab moisture with the bacterial suspension. The disks were placed on MHA plate with the help of sterile forceps and different concentration (1000 μg, 500 μg, 250 μg and 100 μg) of each samples were loaded on disks. Blank disc impregnated with solvent dimethyl sulfoxide followed by drying off was used as a negative control and amphotericin B (10 μg/disc) used as a positive control. The plates were incubated for 24 h, at 37°C. Then the microbial growth was determined by measuring the diameter of zone of inhibition. Data were analyzed using independent t-test. The level of significance was set at 0.05. 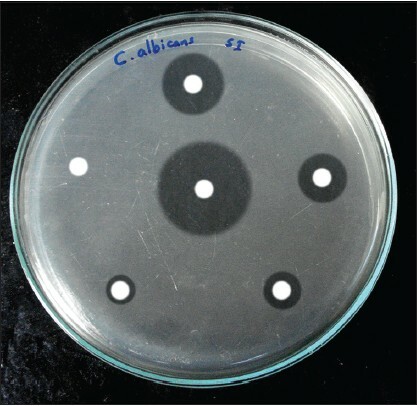 M. citrifolia extract at 1000 μg/ml concentration effectively inhibited the growth of C. albicans (16.6 ± 0.3) compared with the positive control - amphotericin B (20.6 ± 0.6) [Figure 1]. M. citrifolia showed maximum inhibition at 1000 μg/ml, followed by 500 μg/ml (13.6 ± 0.3), 250 μg/ml (8.6 ± 0.3), and 100 μg/ml (8.3 ± 0.3). The inhibition pattern was seen to increase with the increase in concentration of the extract [Table 1]. Thus, it was the dose-dependent reaction. An independent t-test was done to compare the action of M. citrifolia extract and amphotericin B against C. albicans. The P value was found to be >0.05, it is concluded that there is no significant difference in the mean value between M. citrifolia extracts and amphotericin B against C. albicans [Table 2]. Previous studies have claimed that the M. citrifolia fruit extract shows anti-fungal effects on Candida infections. , However, scientific studies on the anti-fungal properties of M. citrifolia are scarce. As with other studies, this study also has its limitations as it is an in vitro study. Further in vivo studies have to be conducted to check the safety, tolerance, and cost-effectiveness of the extract. Other important factor that needs to be analyzed is that, M. citrifolia is a natural plant and the active ingredients may not always be stable and the exact mechanism of action against Candida is also not explained. Thus, further studies should confirm the action of the active ingredients present in M. citrifolia fruit in the inhibition of candidal growth and also the dosages and formulations as an oral anti-fungal agent. 1. Lotti TM, Parish LC, Rogers RS. Oral diseases. 3 rd ed. Textbook and Atlas. Springer-Verlag: Berlin; 1999, p. 115-8. 2. Greenberg MS, Glick M, Ship JA. Red and white lesions of oral mucosa. Burket's Oral Medicine. 11 th ed. 2008, Hamilton, Ont: BC Decker. p. 79-84. 3. Dangi YS, Soni ML, Namdeo KP. Oral candidiasis: A review. Int J Pharm Pharm Sci 2010;2:36-41. 4. Samaranayake LP, Keung Leung W, Jin L. Oral mucosal fungal infections. Periodontol 2000 2009;49:39-59. 5. Pons V, Greenspan D, Lozada-Nur F, McPhail L, Gallant JE, Tunkel A, et al. Oropharyngeal candidiasis in patients with AIDS: Randomized comparison of fluconazole versus nystatin oral suspensions. Clin Infect Dis 1997;24:1204-7. 6. Wang MY, Su C. Cancer preventive effect of Morinda citrifolia (Noni). Ann N Y Acad Sci 2001;952:161-8. 7. Wang MY, West BJ, Jensen CJ, Nowicki D, Su C, Palu AK, et al. Morinda citrifolia (Noni): A literature review and recent advances in Noni research. Acta Pharmacol Sin 2002;23:1127-41. 8. Furusawa E, Hirazumi A, Story S, Jensen J. Antitumour potential of a polysaccharide-rich substance from the fruit juice of Morinda citrifolia (Noni) on sarcoma 180 ascites tumour in mice. Phytother Res 2003;17:1158-64. 9. Banerjee S, Johnson AD, Csiszar K, Wansley DL, McGeady P. An extract of Morinda citrifolia interferes with the serum-induced formation of filamentous structures in Candida albicans and inhibits germination of Aspergillus nidulans. Am J Chin Med 2006;34:503-9. 10. Nayak A, Nayak RN, Bhat K. Antifungal activity of a toothpaste containing ganodermalucidum against Candida albicans-An in vitro study. J Int Oral Health 2010;2:51-7. 11. Rethinam P, Sivaraman K. Noni (Morinda citrifolia L) the miracle fruit-A holistic review. Int J Noni Res 2007;2:4-37. 12. Jainkittivong A, Butsarakamruha T, Langlais RP. Antifungal activity of Morinda citrifolia fruit extract against Candida albicans. Oral Surg Oral Med Oral Pathol Oral Radiol Endod 2009;108:394-8. 13. Jayaraman SK, Manoharan MS, Illanchezian S. Antibacterial, antifungal and tumor cell suppression potential of Morinda citrifolia fruit extracts. Int J Integr Biol 2008;3:44-9. 14. West BJ, White LD, Jensen CJ, Palu AK. A double-blind clinical safety study of noni fruit juice. Pac Health Dialog 2009;15:21-32. 15. Prasanna Neelakantan, Nithya Jagannathan, Nabeel Nazar. Ethnopharmacological approach in endodontic treatment: A focused review. Int J Drug Dev Res 2011;3:68-77. 16. Supreetha S. Antifungal activity of ginger extract on Candida albicans: An in vitro study. J Dent Sci Res 2011;2:1-5.